2015 was a year of many changes, challenges, triumphs, and moreover, great climbing – it’s definitely an interesting time to be alive and a part of the outdoor community! 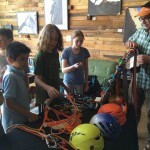 Amidst our busy year of cranking out fun and informative events, we’re so pleased with the alliances we’ve developed with gear companies, non-profits, guiding companies, and most importantly, climbers. Throughout the ebb and flow, we’d pause in the wake of the action to appreciate how supportive this amazing city has been. Now with the smoke clearing, we couldn’t be happier to reflect on the relationships we’ve developed and the endearing community that surrounds us. To mark the end of 2015, we’d like to recap on just a handful of the events we’ve had this year. 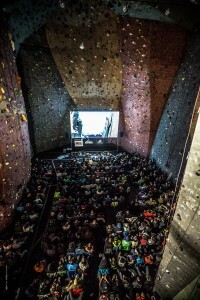 After The Petzl Experience clinic, we opened the climbing community to both educational and entertaining slideshows — events that not only inspire us to experience climbing areas, but also provide the complex logistical beta to do so safely. 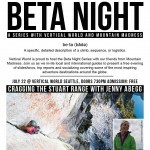 This event highlighted the friendships with our long time local guiding company, Mountain Madness. 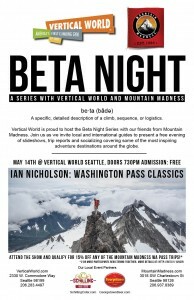 With the goal of providing guides a platform to share both their story and beta-filled trip reports, Beta Night event series started off with Washington Pass guidebook author Ian Nicholson. 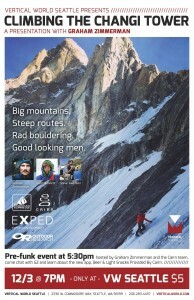 The Supertopo guidebook Washington Pass Climbing outlines arguably the best alpine rock climbing area in the Northwest. Ian covered his favorite route of each grade from 5.8 – 5.12 and inspired us one pitch at a time. 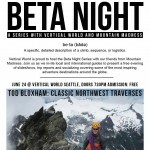 Ian’s slideshow set the stage for the summer’s remaining Beta Nights Classic Northwest Traverses with Tod Bloxham and Cragging in the Stuart Range with Jenny Abegg. 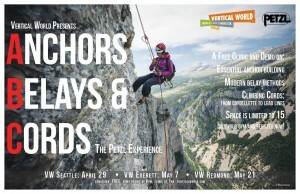 Huge thanks to Mountain Madness for their generosity in bringing us these talented PNW guides. 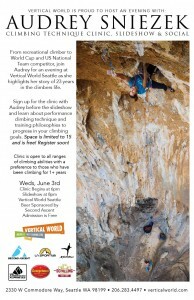 Our first joint clinic and presentation of the year was with local La Sportiva athlete Audrey Sniezek. As a successful software engineer and accomplished 5.14 climber, she embodies the goals of many Seattle climbers: hold down a demanding job and continually challenge ourselves with our climbing. During her clinic she focused on footwork and made it clear that no matter how long or how good of a climber you are, we can always improve our footwork. After the keg of Georgetown Brewing was tapped, we saw some stunning photos of Audrey by Seattle based photographer Luke Allen Humphrey. On routes such as the Kalymnos Greece classic Fun de Chichunne (5.13b) and her FFA of Lost Horizon (5.14b) at Little Si in North Bend, WA. Then we got into the beta that many people came for: her training plan. Which of course is an immaculate and efficient spreadsheet in calendar form that lays out climbing days, off-wall training, rest days, and went as detailed as including periodization. “Work hard, climb harder” was definitely the theme of the night. 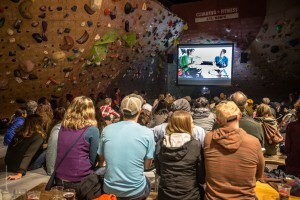 One of our bouldering events this year was with none other than Kelly Sheridan, author of the new Leavenworth Bouldering guidebook. 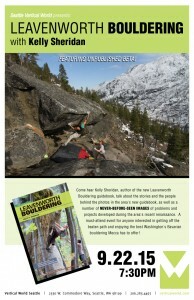 Since the release of Kelly’s book, Central Washington bouldering in 2007, Leavenworth has seen leaps in development. Kelly gave us some background on how he started exploring Leavenworth while working there as a baker to leave time for his climbing endeavours. What’s amazing is that by the time he was deep into writing Leavenworth Bouldering, he was a full-time lawyer. In the midst of working at a firm, he was working on the book on evenings and weekends. 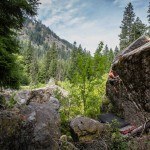 In addition to venturing out to climb, photograph, and document Leavenworth’s Icicle Canyon, Tumwater Canyon, and Mountain Home Road areas. 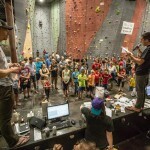 To kick of our summer we hosted the 13th annual year of our longest standing event, Summer Slam Climbing Competition & Party. 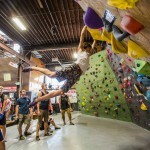 What’s unique about the comp format is its inclusiveness in skill level and discipline — climbers are welcome to compete across boulder, top rope, and/or lead. However, to earn the maximum potential of points, a climber will have to score points across all three disciplines. 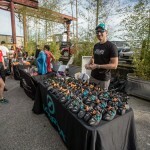 For it’s 13th year we decided to invite more of our local partners in the outdoor industry to join us in the beer garden, including Petzl, Black Diamond, Second Ascent, Maria Hines Restaurants, La Sportiva, Evolv, Arc’teryx, Metolius, So Ill, Five Ten, Ramuta Resoles, Feathered Friends, and more.. Huge shoutouts to Laili Couper top female and Andrew Piper top male! 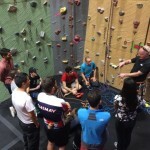 Andrew volunteers on our Belay Army staff to help with groups and birthday parties in exchange for membership. 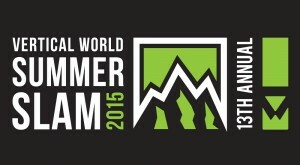 So rad seeing a Belay Army volunteer on the Summer Slam trophy! 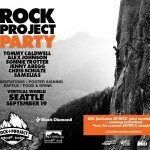 The inaugural year of the ROCK Project Tour came to Seattle and this 3-day event was the highlight of our year. 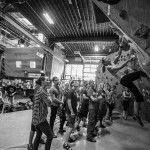 70 participants had the amazing opportunity to take all day clinics from Tommy Caldwell, Sonnie Trotter, Sam Elias, Alex Johnson, Colette McInerney, and Jenny Abegg. The Friday before the weekend’s events we brought those all-star athletes together with Vertical World’s instructional staff to craft the curriculum for sport, trad, and boulder clinic tracks. Seeing our instructors Morgan Miller, Alex Aizenman, Meg Coyne, and Mattie Wheeler co-instruct these clinics with the athletes is a sight we won’t soon forget! 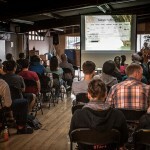 That night after the beer and cider arrived from Georgetown Brewing and Schilling Cider, we transitioned into athlete presentations and a Access Fund membership drive. Some of the highlights were Alex Johnson telling us to “cuddle something” during the frustrating phases of working our projects, and Sonnie Trotter stripping down to bright red spandex whilst describing the german climbing culture on a recent trip of his with Alex Megos. The Sunday of the ROCK Project Tour we teamed up with the Washington Climbers Coalition to organize stewardship projects at our beloved Index Town Walls. The day called for rain which left everyone unsure of whether we’d be leaving our climbing packs behind. After a solid afternoon of removing blackberry from the base of Lower Town Wall, scrubbing graffiti from the Inner Walls, and cleaning up up heaps of trash, the rain cleared! Seeing Black Diamond athletes hesitate on Index 5.11 was both inspiring and comforting that we’re not alone in our struggle at the Town Wall’s old school routes. 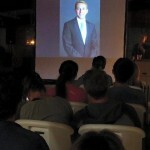 By the time everyone gathered for a BBQ at the Outdoor Adventure Center, the vibe in the room was contagious. The closing statements from the Access Fund Education Director Travis Hebert reminded us of why we care so much about our climbing community and the areas we go to recreate. 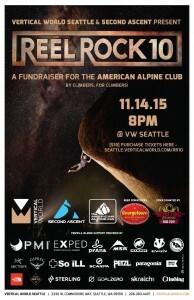 For our fourth year of hosting the Reel Rock Fundraiser at our Seattle location, the community rallied for another sold out night with 500+ climbers, amazing brand support, free beer and popcorn, and raised over $9600 for the American Alpine Club. As our largest fundraiser and in-house event, we’re constantly amazed at how we can transform the gym into a full fledged event venue with double projections and the best audio and visual available. 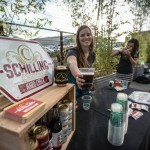 Our friends at Georgetown Brewing donated 10 kegs and our partners from Schilling Cider donated several dozen cases of cider. Immense support was provided by the good brand and rep folks at EXPED, PMI Ropes, prAna, MSR, Mammut, Evolv, Big Agnes, Arc’teryx, Osprey, So iLL, SCARPA, PETZL, Patagonia, Convoy Coffee, Rakkup, Sterling Ropes, and Metolius! We’re so excited to bring the next show in 2016! 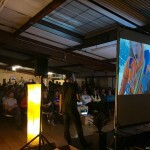 The year of events culminated during Climbing the Changi Tower with Graham Zimmerman. A recount of the first ascent of Changi Tower’s (6500m) North Ridge (M6 5.10 A2, 600m) by Graham Zimmerman, Steve Swenson, and Scott Bennett in Pakistan’s Karakoram Range. 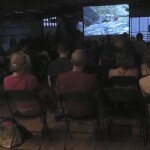 It was here that we saw the year’s momentum culminate into an incredible slideshow and a packed house. Graham’s storytelling combined in Pakistan’s mountain culture, stunning scenery, and troubled political history into a captivating evening. Big thanks to Graham’s sponsors – EXPED, Outdoor Research, and the guys at Cairn App - for the support and contributions to make the night wildly successful! 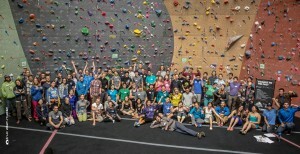 We are so grateful for the Seattle climbing community. Thank you for making 2015 rad! 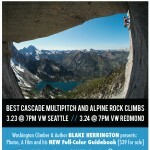 Stay tuned for another exciting year for VW events, including Blake Herrington’s March 23rd show, celebrating his new guidebook Cascades Rock! For more info on our upcoming events, subscribe or follow us on Facebook.